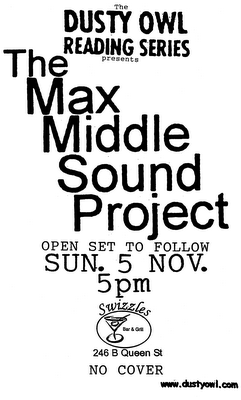 I'm preparing the program for the Max Middle Sound Project performance at the Dusty Owl. This show will involve many voices sounding poetry scores written by yrs truly & others. 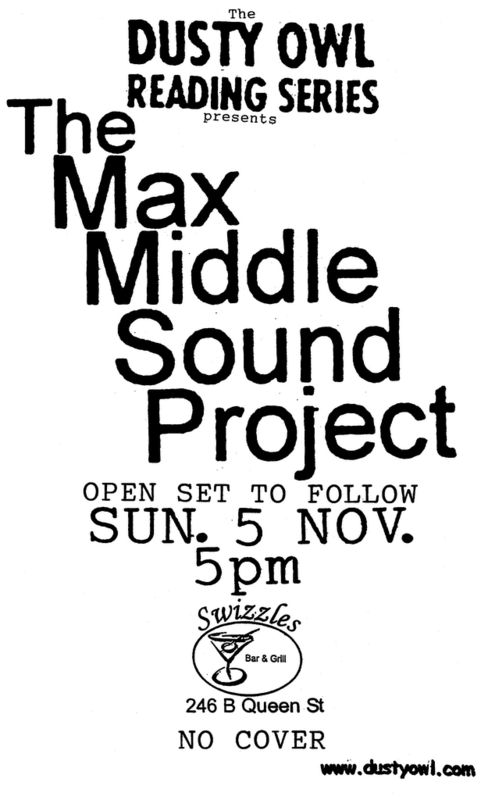 To find out more y'll just have to head over to the Owl in its Swizzles home on November 5th at 5pm. Posted by Max Middle at 9:57 p.m.
Posted by Max Middle at 9:50 p.m.
Posted by Max Middle at 11:16 p.m. I've recently started publishing the Puddle leaflets series under the Griddle Grin imprint. Ideally seeking combinations of verse & visual poetry (yes... in whatever form such combinations may occur). Submissions of work resembling simply either ‘linear’ or visual poetry are also welcome! Printing format: one sheet of 8.5 x 11" paper, one or both sides, black & white. Subscription to be announced soon. Posted by Max Middle at 10:58 p.m.